Too many brands and businesses still try a scattershot approach at social media. They try to be everywhere and spread their efforts too thin. They also apply a one-size-fits-all approach. Whether it’s in-house or external social media marketing teams, they craft campaigns around a single communication style and a rigid set of formats — and expect them to drive the same results across platforms. Particularly for smaller or niche players — or really, anyone on a constrained budget — it makes more sense to double-down on a single platform, learn its idiosyncrasies, and become an expert at cultivating its audience base. 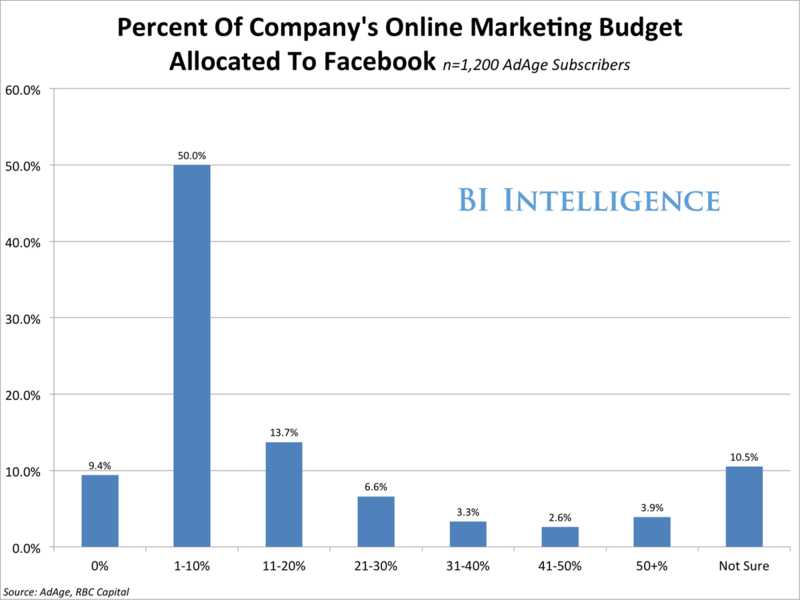 Social media budgets become more manageable. Your organization will no lon! ger leak dollars with a half-hearted attempt to be, and post everywhere. Brands and businesses will gain a more authentic voice. It’s difficult to develop a genuine, humanized voice on every platform. Attention to a single network will help brands cultivate a more persuasive personality. Become more efficient. Many companies on social media see a great deal of success on one platform, but still grind away at others. Why not focus resources on where your engagement is deepest? Improve your chances at earned media and viral success. These grow out of a deep understanding of a social network’s idiosyncrasies, not by throwing everything at the wall to see what sticks. Develop a knack for avoiding social media gaffes and bloopers. Many of the social media foot-in-mouth moments of recent years grow out of a lack of comprehension for what makes each network tick. 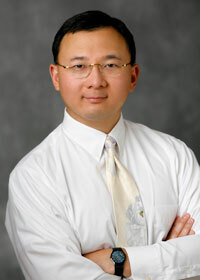 Users have developed sophisticated network-specific cultures. They can spot a poser from a mile a way. Creative freedom: This may sound counter-intuitive, since choosing to focus energies on a single platform would seem to close off options. But focus actually opens up opportunities. Ideas come more easily once a single primary platform is chosen. Drive better recruiting and contracting decisions. If a single platform is prioritized, the search for social media talent becomes clearer. Different kinds of expertise are required for each network. Finally, a deliberate platform-centric approach allows for more straightforward testing and tracking of results. If one platform focus doesn’t work, another emphasis can be tried. But data will be cleaner and priorities will be easier to rearrange. It’s true: In many cases, HTML5 can work just as well as a native approach. HTML5 has established itself as the de-facto alternative “platform,” after Google’s Android and Apple’s iOS. But it is not the silver bullet it is often made out to be, for several reasons. HTML5 faces a fragmentation issue of its own, since there are gaps in the range of HTML5 app features supported by the different mobile browsers. Backers of HTML5 are working furiously to fill those gaps. 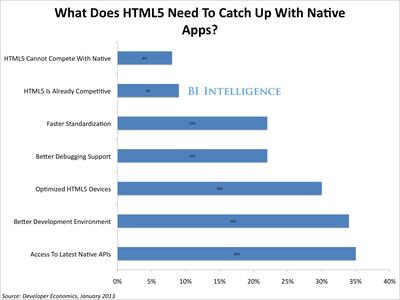 So where are we in the HTML5 vs. native apps debate? The status of HTML5 is vital to decisions about where to invest mobile budgets. In an August 2013 report, BI Intelligence analyzes this very question. In the report, we do a head-to-head comparison of the two, explain the specific reasons why HTML5 has some clear advantages over native apps for mobile development, look at adoption data, analyze the barriers to HTML5 as a development tool and explain how HTML5 is starting to overcome them, look at the current state of the performance advantage held by native apps, and explain why in a hyper-fragmented mobile landscape, HTML5 has emerged as the long sought-after “third platform,” allowing for mobile Web apps that cut across fragmentation. Graphics: Web apps are far along in allowing for scalable (users can enlarge them by zooming in) graphics that allow for “the creation of very advanced and slick user interfaces,” according to the W3C, the nonprofit that creates the HTML5 standard. Multimedia capabilities are improving. Video and audio playback has become a widely-supported and widely-used HTML5 mobile app feature. Other multimedia features are still in a more nascent stage. Responsiveness: HTML5 apps can be written so that the device type is detected, and an appropriate app version is delivered. That’s important because of the variety of screen sizes out there. The layout, behavior and resolution are optimized for the screen. User Data: Web apps are far along in their ability to store app data so that users can return to an app and pick up where they left off. Smooth offline usage is an area that needs more improvement. Geolocation on Web apps is now basically a solved issue across mobile browsers, while integration with user calendars and address book data is still a work-in-progress. Digital ad spending is currently weighted towards direct response over branding, but that tilt will soon disappear, according to an eMarketer forecast. 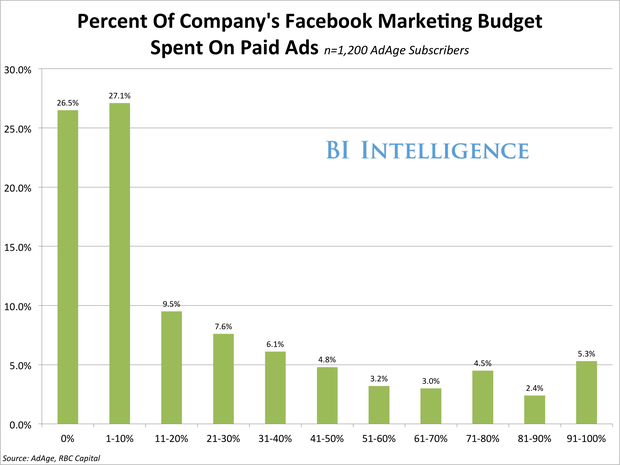 This year, eMarketer expects that 6 in 10 digital ad dollars will go towards direct response. By 2017, though, advertising dollars will be split almost equally between branding (48.5%) and direct response (51.5%), as the former enjoys double-digit spending growth throughout the 5-year forecast period. Indeed, brand advertising spending growth will outpace direct response in each year of the forecast, with increases of 18.1% and 11.2% respectively this year and 10.5% and 3.6% respectively in 2017. The eMarketer forecast aligns with recent survey results from Vizu and the CMO Council, in which 61% of respondents said they are re-allocating budgets away from direct response to brand advertising initiatives. 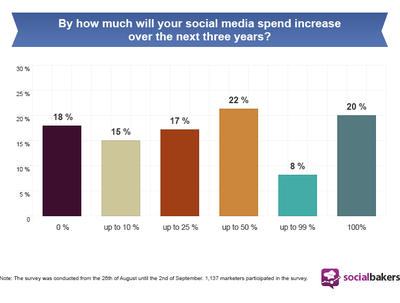 That same survey revealed that 70% of brand marketers expect to up their spending on social media advertising, while similar proportions will increase mobile (69%) and video (64%) ad spend. Interestingly, though, a more recent survey of global marketers (predominantly in Europe) found that few count branding as their top objective for social media ad buys, leaning instead to lead generation. That was a different result than found by Vizu and AdAge in separate surveys indicating branding to be the clear-cut objective for social ad campaigns. The line between branding and direct-response campaigns tends to be blurring, says eMarketer, which may explain some of the discrepancies in social advertising goals. In any case, the researcher attributes the greater focus on branding to digital’s growing presence in consumers’ media time. That same explanation was given by Vizu and the CMO Council in their survey, with the researchers suggesting that brand marketers and their ad dollars will follow consumers to their chosen digital media channels, whether they be online, tablet, mobile, or connected TV. Online video has become an increasingly popular advertising channel, with many marketers shifting budgets from TV to fund those efforts (see here, here, and here). Such a response might imply that traditional TV consumption is falling off a cliff, succumbing to the soaring rise of online video. While TV and online video consumption are no doubt linked, looking only at their isolated trends can prove misleading, masking what continues to be a vast gap in consumption.